In this part of the world, school is starting back. I just passed a sign on a local pool the other day that said, "Pool closed. Thanks for a great season." Buses are filling the streets each day now. We had such a fun summer, it's a little depressing for summer to be wrapping up. Back to school doesn't have to be dreaded, though. By spending a little time up front preparing, you can get a head start on a wonderful year. The beginning of the year is a great time to start a back to school routine. Kids are fresh at the beginning of the year, it can be a great time to get kids off to a strong start academically. Back to school can be more fun when you pair books about school with fun activities about school. Back to school doesn't have to be a bore. 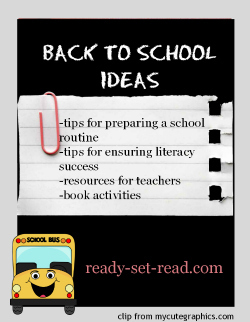 I have rounded up some of my most popular back to school ideas here at ready-set-read. There are free resources for parents and teachers. Take a little time to check it out and get ready for a great year!